This weekend I actually had time to play! Oh, I love to play! 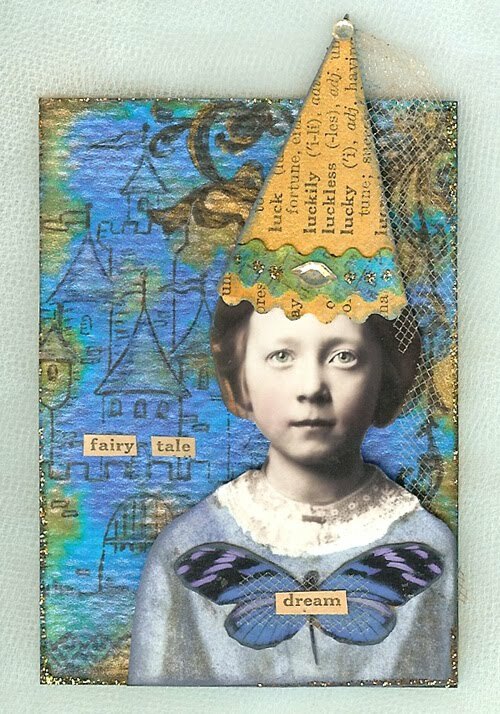 I made this fun ATC for the monthly lottery over at Paperwhimsy. The theme is "Castles", I luckily had an old stamp of a fantasy castle, which I stamped over some H20 shimmering watercolors. The images are from Paperwhimsy. I do enjoy dreaming about beautiful homes, just like this whimsy girl. I love to make all kinds of jewelry. 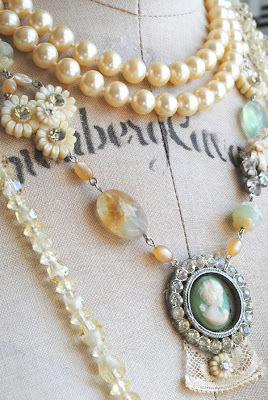 This is what I call a "vintage collage necklace". I used some white flowers from my friend Marlynn, and created a side focal piece, and then used a vintage rhinestone and cameo for the main focal piece, backing it with an old scrap of lace. This is a mix of vintage beads, vintage rhinestones, vintage lace, a vintage clasp (not shown) and some natural stone beads I fell in love with. 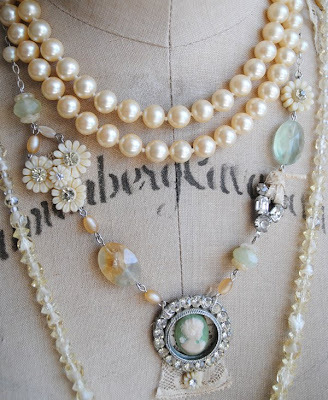 The pearl necklace at the neck is from an antique store, and the crystal necklace is from a thrift store. I left them on the mannequin just for show, I don't think I would wear these all together! Now I need just the right top to wear my necklace with. I am all excited about making my first cloth doll. I bought Cloth Doll Artistry by Barbra Willis at Joann's Fabrics last week and I have been mesmerized by it ever since. I hope tomorrow to get to give it a go. I am looking forward to collecting fabrics for the outfits. Thank you again, for stopping by. I just got my email notification of the paperwhimsy sale! Did you get yours? Have fun with the cloth dolls...I really want to makes some too. Your jewelry is just beautiful, you are a woman of many talents. Yay to play, Yay to play, for I could do this every day!!!! This was a lovely post full of beautiful things! Thanks for sharing! Blessings. I am drooling all over the keyboard this morning! Your ATC is just the sweetest thing ever! I love the castle and wonderful details you incorporated. I love your artwork! I'm glad you had time to create over the weekend. Your jewelry is gorgeous! The book looks so great. A definite must for me. I'll put it in my faves. Your necklaces are really pretty, I love them! What a wonderful ATC! I just love it! And the gorgeous jewelry speaks for itself--you are so very talented! I love your necklace Terri; you are multi-talented! Sweet ATC also....great colour combination. i like it very much too! Winner of my French Friday Giveaway!